Missing teeth can make it difficult to eat, which can leave you restricting yourself to soft, bland foods. Getting dental implants can reintroduce you to flavours you’d long ago given up on enjoying. With dental implants, you can rediscover the joy of eating the foods you love, bite into those crunchy delights and get back to the full, rich taste of life that you’ve been missing out on. If you are missing one or more teeth, and you have healthy bone and gums then yes, dental implants are the right choice for you. One of the greatest benefits of getting dental implants is the change that it has on your everyday life. Our patients are able to gain confidence in their smiles when it has often been lost for years. You may find your grandchildren commenting happily that they’re finally seeing you smile in family photographs. If you’d like to review and compare non-implant options for replacing missing teeth, keep reading below. If you’ve been hiding your vibrant grin because you’re uncomfortable about missing teeth, dental implants will give you the boost you need to show off those pearly whites once again. With Apple Dental Implant Centre, you can discover a personalized treatment plan that’s tailor-made to suit your individual needs. If you’ve gotten a quote or estimate from another provider, we’ll happily take a look at what you’ve been offered and let you know if we can offer the same solutions for less. Or, review and compare non-implant options for replacing missing teeth. Ready To Book Your Consultation? Let's have a free conversation to find out what will work best for you! Getting a dental implant can be a big decision, not only because of cost (learn how we’ve reduced dental implant costs), but also because it is a permanent surgical procedure. The benefits of dental implants however, can make this decision a lot easier. Below are our top five reasons for considering dental implants. If you’re missing a tooth or teeth, you know how difficult, and even painful, it can be to eat the foods that you love. Replacing a missing tooth with dental implants can give you back the joy of eating normally again. If you love food and enjoy the satisfaction of biting and chewing comfortably, dental implants can restore that feeling. The bone in your jaw requires regular use to remain strong and healthy. If you’ve lost a tooth or teeth, that portion of your bone is no longer being used, which can lead to bone loss. The same way that muscles atrophy and shrink when not used, your bone can shrink, becoming smaller and weaker. Also, over time this can even have a visible effect on the appearance of the face, creating shrunken cheekbones and prematurely aging your face. The more missing teeth, the greater the risk. Implants are inserted directly into the bone, stimulating and contributing to the health of the surrounding bone, preventing bone loss and ensuring that the appearance of your face and smile won’t suffer from the missing tooth or teeth. Dental implants are a permanent solution. In most cases, once inserted, an implant will never need to be replaced. And since they’re inserted directly into the bone, they are secure and strong and will serve you as well as your natural teeth. It really is quite amazing how they can function so much like real teeth. You won’t notice the difference except in your smile, confidence and enjoyment of life. The crowns that are attached to an implant are highly durable and crafted to match your smile. Colour, shape, and size are all uniquely measured and matched, to give you the best possible fit and function. The extremely accurate and precise technology used for measuring and crafting your implants is as much art as science. You’ll love your new permanent teeth. If for some reason it became necessary to replace the crowns attached to your implants, this can be easily and painlessly done by your dentist, as simply is unscrewing the old crown and screwing on the new crown. So go ahead and live your life to the fullest and participate in the activities you love. See Dr. Ed Wong, of Apple Dental Implant Centres, discussing options for replacing missing teeth on CTV’s Ask an Expert. Dental implants have become an increasingly popular choice because of their effectiveness, convenience, durability, and ability to be inserted without damaging adjacent teeth. The biggest issue with dental implants since they came on the scene has been their cost, but Apple Dental Implant Centres have reduced that barrier by reducing the costs. Learn more about how we’ve reduced dental implant costs. There are many different options for replacing missing teeth. Traditionally, patients would get bridges, dentures, or partial dentures, depending on the number and condition of missing teeth. Compare some of the traditional solutions that implants replace. Dentures are sets of false or fake teeth that you place on the top or bottom of the mouth using some dental adhesive. Dentures require a much shorter time span to prepare compared to dental implants and less time in the dentist’s office. 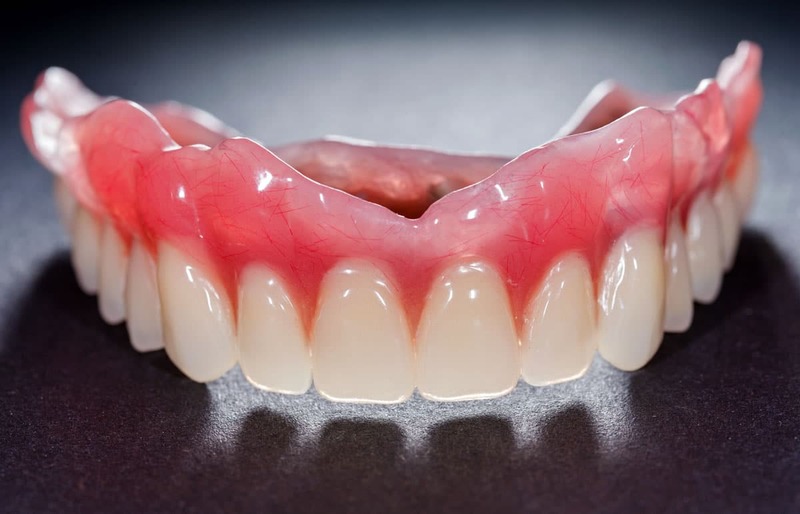 Dentures work best for people who have fragile gums or a weak jaw. 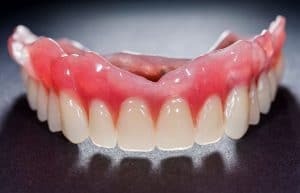 However, the problem with dentures is that despite dental adhesives, there are still chances where the dentures can become dislodged from your mouth which can be an embarrassing experience. You also can’t use dentures to bite into hard foods as they may break. Dentures also feel somewhat unnatural and can make speaking clearly difficult. Do you have dentures? Read more about Implants vs. Dentures. 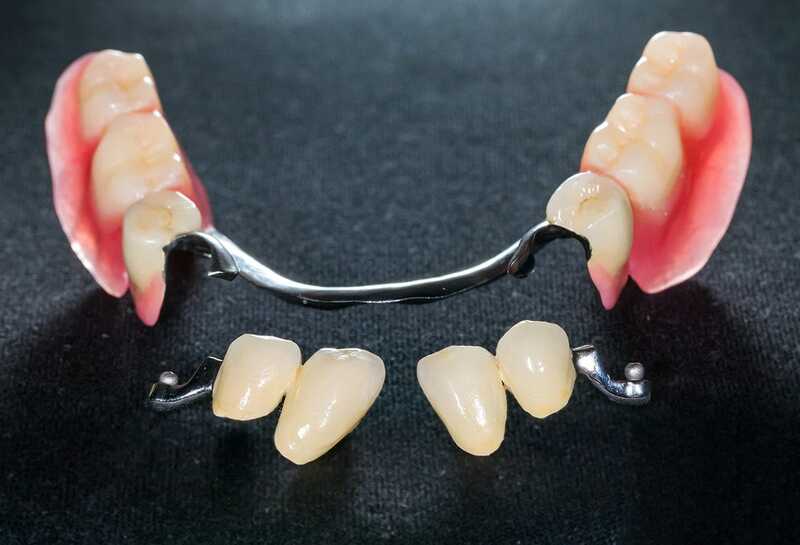 A removable partial denture uses clasps that get onto adjacent, healthy teeth to hold the denture in place. The clasps, which are developed to fit snuggly onto the healthy teeth put pressure on the underlying gums and natural teeth they hook onto. This deteriorates the jawbone and loosens the supporting teeth, which often causes additional missing teeth. In addition, due to the fact that there is no root system for the missing teeth, the integrity of the jawbone is jeopardized, and the melting away of the bone (atrophy) is, in fact, sped up, leading to more rapid bone degeneration. For many years, a ceramic bridge has been the suggested solution for the replacement of individual missing teeth, or teeth that have been harmed beyond repair. 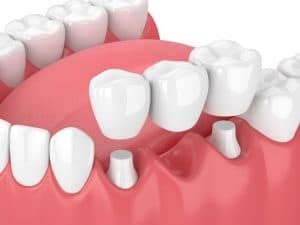 To install a bridge, your dentist will need to grind material from the adjacent teeth in order to affix the bridge that is manufactured to span the missing tooth. While effective, this also has the effect of weakening the adjacent teeth and therefore is not as durable as implants. By contrast, dental implants fit seamlessly between the adjacent teeth without harming them, and have the additional benefit of preventing bone loss in the space of the missing tooth. More about dental implant options from the Canadian Dental Association. Why Apple Dental Implant Centre? © 2019 Apple Dental Implant Centre. All rights reserved.